It’s a new day in America: The United States’ new Democratic president combats hostile political opponents and right-wing media while tackling the challenges of terrorism, global warming and a financial crisis. In the midst of the fray of a charged first term, the president’s liberal daughter, Karen, falls for a decorated Air Force pilot turned Secret Service agent, Capt. John “Rawhide” Cunningham – who, as the grandson of a conservative, swing-vote Supreme Court justice, stands at the opposite end of a vast, ideological chasm. Inspired by his work in the real-life presidential elections of 2000 and 2004, author Charles A. Santangelo weaves a tale of love and political intrigue that speaks to the very core of American values and the integrity of the political process. Told through a progressive ideological perspective, Turning Point makes a compelling case that a scant few with strong values and a willingness to place the nation’s interest above their own can change the course of history. The political/historical thriller blends the action of a Tom Clancy tale with sharp political storytelling and a measure of romance. The 2000 election was a swamp of controversy, no matter how you cut it. 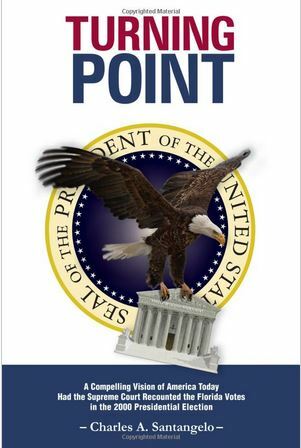 Turning Point is a political fantasy from Charles Alfred Santangelo, veteran government official at NASA and Homeland Security. For sake of hypotheticals, he does away with the names of Bush and Gore, instead crafts a What If scenario of a Progressive Democrat claiming the White House in 2000, and what would have followed in many crises, from the environment to a different handling of 9/11. Turning Point is an intriguing look at a very different political world. WOW, what an amazing topic to write about…. an election that tore the country apart and what a fascinating idea to write a novel about what this author believes the world might have been like if Al Gore had assumed the role of President. Whether you side with the Dems or the Republicans — no one can argue that it is intriguing to know just what direction life would take if things were to have come out differently– such as with everything in life, decisions that seem simple enough really have the chance to change the course of history. My politics are somewhere in the middle, but I found learning “Turning Points” ideas of how life could have been very interesting! This terrific novel is not only a page turner, but is also a fascinating and comprehensive look at a wide spectrum of American life, including election fraud, legal intrigue and the economy, all set against a backdrop of a compelling story of love and political tension. Alternative history novels are difficult to bring off, because you have to account for a myriad of ripple effects across the societal spectrum, but the author has accomplished this in an impressive and authoritative manner. Quite an achievement. I’m waiting for the movie, which is inevitable.